Important news: although Neptune's Brood is officially published next Tuesday, and Big River Co won't release the ebook early or ship dead tree editions before Monday, I am receiving reports that hardcovers have been sighted in the wild in branches of Waterstones! And if you want to read the first chapter, Orbit (my UK publisher) have made it available here. Buy my book; help pay my elderly cat's vet bills. Way to go, Charlie! Congrats on Neptune's Brood being in (some of) the stores. What's the difference between the $18.59 Kindle book on Amazon.com and the $14.42 Kindle book on the same site? I have no idea what you're looking at, but: there is a hardcover edition, and a somewhat cheaper Kindle edition. You aren't in the US, otherwise it wouldn't be mentioning international wireless delivery to your Kindle, and VAT. I have NO idea why you're being offered two different Kindle editions unless you're in a non-exclusive territory and are seeing both the US (Ace) and UK (Orbit) Kindle editions, with sales tax on top. Well, if the more expensive edition doesn't include author nudies or a more subtextual plot, I'll just go for the cheaper one, if that's all right. Yeah, got one. Was unsuccessfully searching west London Waterstones branches for a copy of The Traders War (vol 1 and 3 seem more available), but more than happy with my consolation prize. Didn't Borges write a story about that? not until i finish Debt: The First 5,000 Years! Weird Amazon pricings can also be due to their often-bizzare method of discounting. Which they seem to to against themselves as well as others. For what it's worth, I've just had a message from the River People saying "new estimated delivery: this Saturday". Will definitely help pay vet's bills - I've just sent a p.m. to your address, asking for delivery this weekend - moolah to be handed over! I just received my hardcover copy in the post, ordered online from http://www.bol.com/nl/p/neptune-s-brood/9200000010532743. They seem to have listed the release in June instead of July for some reason? 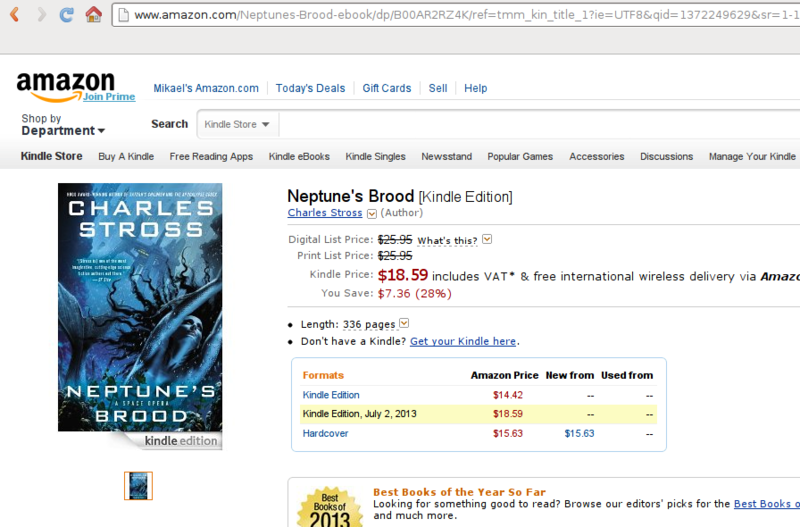 So the book is by "science fiction legend Charles Stross"? "The dreaded package arrived from the accursed bookstore of the mad American Jeff Bezos." Charlie Stross, Charlie Stross, Charlie Stross, dumdumdum. Now I'm trying to picture Charlie without his facial hair. Nope. Someone will have to hand me a razor. And some rope. Right, got the last copy, now I have some holiday reading ready! So what about the Lupins? I got my preordered copy from my local indy bookstore yesterday. I'd be reading it right now except it's ten feet away and I've been pinned down by my cat. Copy arrived - beer being bought. I have it. So far, pleased. Decided to go to the nearest Barnes & Noble yesterday, just in case it had arrived early. No luck. Just one more reason to miss Borders, I often found books shelved early there. Then on my to the library downtown I got held up in traffic caused by a cattle drive down the main drag. It lasted through three or four changes of the lights at the intersection, and was followed by four street sweeper trucks. Fortunately I was a block away, on a scooter, so I didn't have to smell it. The center of downtown was blocked off the rest of the day for a festival celebrating the start of the Pikes Peak International Hill Climb. Meanwhile, yesterday morning I woke up early and was thinking about a scene for the story I've been working on. I worked it all out in my head and decided that I had to get it down. Ended up writing a 1000 words in an hour--before 7am. Never done that before. Later in the afternoon I added another 1000. This morning, so far, added another 200, but woke with my head splitting, so I'm not going to push it (Writing this instead. Yeah, that makes sense). But I got plenty of coffee and ibuprofen. Might not be much compared to Charlie's recent bout of muse wrestling, but it's a first for me. It feels good when it's flowing. This week has been slower than last -- I'm only averaging 5000 words/day -- and the pace is taking its toll. I'm swimming again (you do not want to neglect your body when you're working this hard) and the upshot is I need hour-long afternoon naps as well, which eat into the writing time. On the other hand, I'm not killing myself. Total so far: 85,000 words in 14 days. I reckon another 25,000 words -- 5 days at this tempo -- to finish a somewhat sketchy first draft. As I'm also providing Orbit with blog entries for next week to coincide with Neptune's Brood, I'll be blogging by proxy over there for a bit (linking from here, of course). Then next weekend is a parental birthday, so I'll be on compulsory Away-From-Keyboard time for a few days. Amazon.com just announced shipping (Sun June 30th). I assume the 2 day prime shipping means I will have it on the 2nd. Looking forward to reading it this week. Mine would have arrived via Amazon (shush) and the postman on Friday. Unfortunately no one was in, so I collected it Saturday. 20 pages to go as of this morning. I won't give any spoilers as I'm still trying to get my head round parts of the plot. Definitely not sure I've caught all the in-jokes on the first pass. ...I need hour-long afternoon naps as well, which eat into the writing time. On the other hand, I'm not killing myself. It's important not to kill yourself. Your source code and data are not yet adequately backed up, and emulations are never quite the same. Mine was not posted till Saturday, so I have not yet received it. Damn, hot mermaid/squid action will have to wait. So, released in 2013. A Hugo candidate therefore for 2014, where Charlie will have the home ground boost. It's both great fun, and posits a whole new class of economics to boot. I would be gobsmacked if it's not on the ballot, and I think it's got a good chance of bringing home the Big One at last. If I may ask: Why do Laundry titles pull you into 5k/day writing jags more than do your other books? Hmmm. Now that you mention it, the laundryverse does contain brain-eating transdimensional entities that can be summoned into parallel worlds using appropriate combinations of symbols. Perhaps the control exerted on Charlie's mind by these entities is ... not quite what it seems? Well, Banksie once said "The Culture is my train set", so maybe the Laundry is Charlie's? Just bought this from Kobo in an effort to route around the incipient Bezos monopsony, but wasn't paying attention to the file format before I clicked the link (in my defence I was under-caffeinated and previous books I've sourced from Kobo have been fine). So I am now the proud custodian of a link to an 'Adobe DRM epub' - which despite the name appears to be some form of encrypted PDF that is currently only accessible to me via the Kobo desktop app. This makes me... not happy - I have Calibre for this stuff precisely so I don't end up with my bookshelf split across a bunch of end-of-life'd software that won't run on Windows 10 or whatever. Needless to say I will be sharing my 'not happy' with Kobo's customer relationship team, but if this DRM shenanigans isn't something you (via Orbit) have agreed with Kobo Charlie, then I imagine you will want to get Orbit's commercial people to have a word with them also. Probably read it over the weekend anyway. It's not implausible that you'd decided that you wanted a second copy in order to give it to someone. Were I to order a second copy and were Amazon to decide not to fulfil that bit of the order because they knew better than me what I wanted, I would be deeply peeved. I did end up getting two copies of one book, having ordered a copy from both Amazon US and Amazon UK. But then I ended up with two copies of another when I ordered one from Amazon and got the author to hand-carry one for me over from Dublin. Kobo couldn't offer me any alternative to the Adobe DRM epub, but they did refund me without any quibbles. So Amazon ended up with my custom after all. This page contains a single entry by Charlie Stross published on June 26, 2013 12:57 PM. Crib Sheet: Halting State was the previous entry in this blog. Another commercial ... is the next entry in this blog.